Rawleigh Williams is expected to make a full recovery from his weekend injury. The Gus Malzahn, Bret Bielema animosity appears to have been put to rest once and for all, the latest evidence came after their two teams met Saturday in a four overtime thriller. 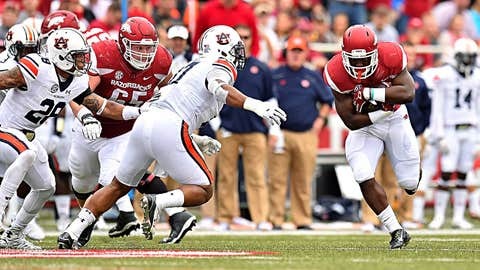 In a classy move, Malzahn made a Sunday morning phone call to Arkansas running back Rawleigh Williams after the freshman was taken to the hospital after a third quarter hit by Auburn’s Johnathan Ford and Krist Frost. While lying on the turf of War Memorial Stadium, Williams had his jersey cut off him before being carted off the field on a stretcher. Fortunately for Williams and the Razorbacks, the young running back is expected to make a complete recovery following the scary moment. "Rawleigh underwent successful surgery Saturday night after injuring his neck in the third quarter of yesterday’s game. He is expected to make a full recovery. A timetable for his return to the football field is unclear, but we are thankful that he is doing well and is with his family. Thank you to everyone for the well wishes, thoughts and prayers."